Experienced, Trusted Asphalt Contractor Now Serving San Antonio! At Bennett Paving, we are proud to have served the Central Texas area since 2005. That includes Austin, communities throughout the Hill Country, and our beautiful neighboring city to the south, San Antonio. If you’re looking for a paving contractor you can trust, you’ve found us! Our trained paving specialists have years of experience in providing only the highest quality services to residential customers and business owners, as well as municipalities and government entities. At Bennett Paving, no job is too large or too small. If you’re in the market for an asphalt specialist in San Antonio, contact our office today for a free quote! It goes without saying that we all want to support local business, but if you need a paving contractor for your home or business project, it’s absolutely vital that you should a local contractor. Our asphalt specialists live and work right here in Central Texas. We know our climate, and we can help you to protect your paving investment throughout our hot summers, our rainy periods, and even the occasional hard freeze. In our business, climate means everything. And only a local paving contractor truly understands the San Antonio climate! At Bennett Paving, we take our job seriously. 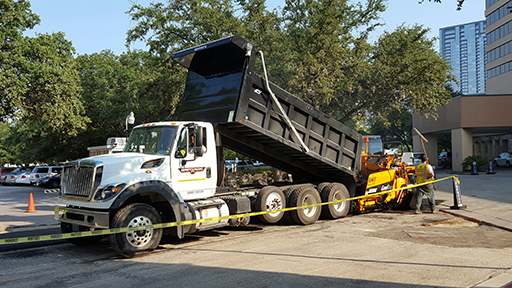 We know that your asphalt or concrete paving project is a major investment, so we send only trained and seasoned paving specialists to get the job done. In fact, that’s all we have on staff here at Bennett Paving – experienced and trained paving contractors who work closely with each client, taking you step by step through every phase of your project. From the expert who’ll provide you with an initial quote to the trained paving workers who’ll complete the project to our experienced customer service personnel who’ll be there for you after the project is complete, we are proud of our professional staff. We know you will be too! We’ve talked a lot about our trained staff and how their many years of experience makes all the difference in the world when it comes to performing quality work on your paving project. But qualified workers aren’t the only thing required to provide excellent paving services – you also need to use the highest quality material, and to provide those services and materials at a price that’s fair and reasonable. And that’s just what we offer to our clients. At Bennett Paving, we understand how important it is for you to stay within your budget – whether that budget is for your household or your business. That’s why we are proud to offer the highest quality paving services available in San Antonio at an affordable price. What more could you ask of a paving contractor!